Mike Epstein was a slugging 1st-sacker for the Senators in the late-1960s. 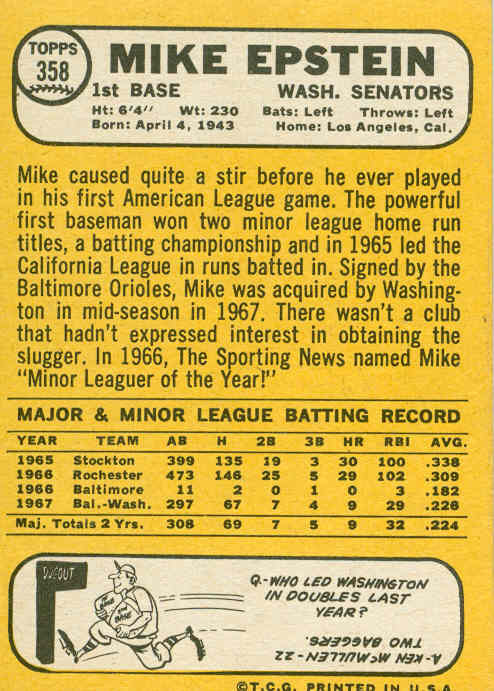 This is his first solo card, after appearing on an Orioles Rookies card in the 1967 set. Prior to being signed by the Orioles in 1964, Epstein was a member of the US Olympic baseball team that won the gold medal that year. 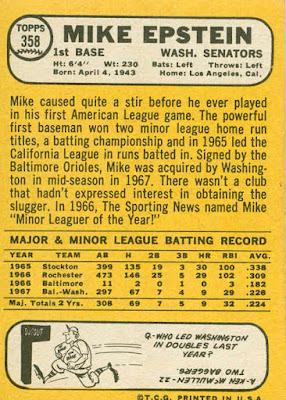 Missing from the back of his card is his time playing for the Orioles’ Florida State Instructional League (rookie ball) team for 3 seasons from 1964-66. He played most of 1965 in class A ball and most of 1966 in AAA ball, and clubbed 30 and 29 homers respectively, along with topping 100 RBI in both seasons. 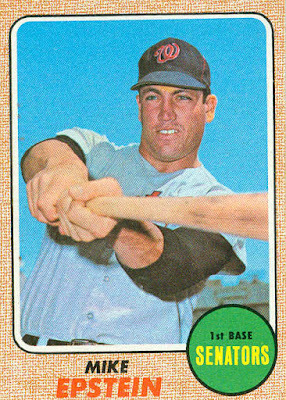 He made his major-league debut in September 1966, but realizing he was stuck behind Boog Powell at first base, he demanded a trade. After cooling his heels on the O’s bench for 2 months of 1967, he was traded to the Senators in late-May (along with pitcher Frank Bertaina) for pitcher Pete Richert. In his first at-bat against his old team, Epstein hit a grand slam. Mike was the Nats’ regular 1st baseman for 3 seasons, starting 107, 115, and 118 games from 1968-70. (Left fielder Frank Howard started most of the remaining games at 1B.) however, his numbers were down from his minor-league stats. His best season was 1969 – reaching 30 HR and 85 RBI. In May 1971, he and pitcher Darold Knowles were shipped to the Athletics for pitcher Paul Linblad, 1st baseman Don Mincher, and backup catcher Frank Fernandez. Following the 1972 season, he moved on to the Texas Rangers, but after only 27 games with Texas, he was flipped to the Angels in a 5-player deal. He was the Angels’ 1st baseman for the remainder of the ’73 season. Epstein started 18 of the first 21 games in 1974, but he and his .161 batting average were released when the calendar hit May.